So, obviously, I have taken a bit of a break from website/writing, as well as from teaching. This is my attempt to come back into that space…. A bit more personal and a little less professional this time. Can you dig? Who am I to think that I can share advice/knowledge/whatever via this outlet when I can’t even keep up consistency? Who am I to even think that others will take me seriously, when I have obviously shown lethargy and poor prioritization, evidenced in my lack of posts over the last few months? Well, I am a human. Not only that, but “a lot” has been happening since October. “A lot” is vague, true; but suffice it to say that getting through the days has been a feat in and of itself, let alone entertaining mental acrobatics regarding heady philosophy. Don’t get me wrong – I love heady philosophy, questions, and talking about yoga, social justice, etc… I’m sure that’s quite obvious. But sometimes you need to take care of your heart first. Also – who ever said that what I share over this online outlet is worthwhile anyway? Maybe I was being a bit presumptuous when I lead myself into believing that I had a particularly high standard to continue to meet. I mean, I’ll be straight with you – I don’t have it all figured out. And I’m not just saying that to try to appear all humble and so you will take me more seriously. Or whatever. And if you think I do (have it all figured out) or that I am (all humble) – well then, you’re utterly bonkers. No offense :-). But I do have some little things kind of figured out. At least, I think so. Rather, some of these concepts have been “figured out” before, by those on the path(s) long before me. I think that there is a lot of truth out there – and a lot of illusions. I guess I’m just sharing my experience as I attempt to find and follow a path. 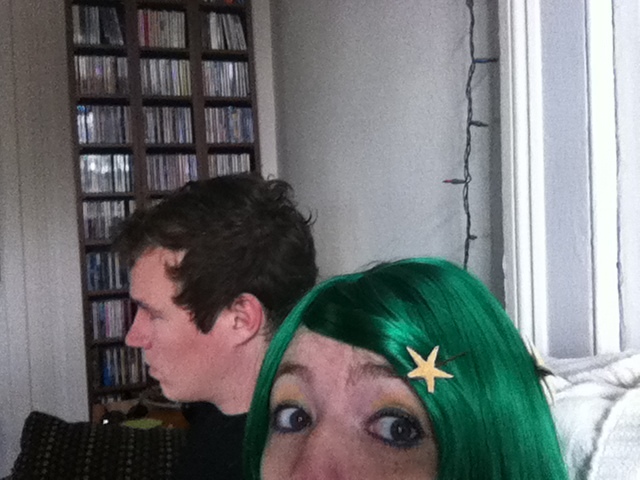 Also – I have to write. It’s one of the things I was made to do. Furthermore, is “consistency” even indicative of worthiness? I have spent my whole life believing that assumption to be true; honestly, I still often believe it is. 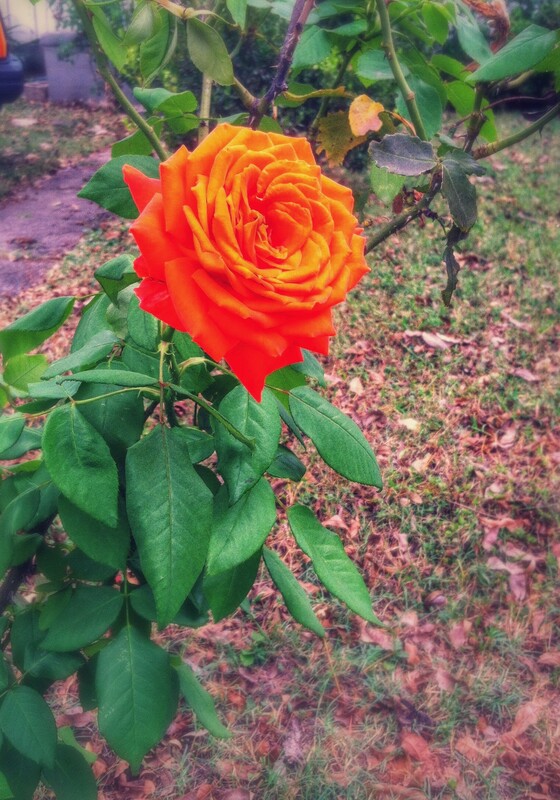 However, I am willing to question it – just maybe, being worthy isn’t cultivated through consistency. I mean, maybe, right? Anyway, I had felt a lot of pressure building up in my psyche about the lack of professional yoga work over the last few months. Now I’m trying to get back into the practice space. I doubt I am the only one who has ever felt that sort of pressure, and how everyone responds to it will be different. Not only that, but sometimes we try different ways of dealing with that pressure. … hey wait a minute – isn’t that what yoga is?! What do I need to be …? * There will an area set up for “resources,” as well – so bring your business cards, flyers, books, and anything else you think that other enthusiasts might want to know about. * I fixed the FB Event page so that it’s now Public invite. 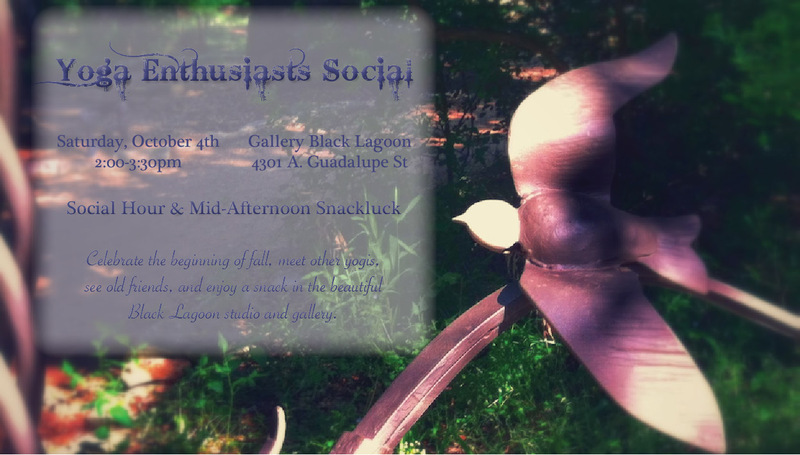 Austin yogis, yoga teachers, and all-around yoga enthusiasts, the time has come for the next Yoga Enthusiasts Social. We would like to gather to hear all about everyone’s summer exploits – maybe you’ve gone to a retreat that taught you a lot about your own practice, or you took the summer off from teaching and had interesting reactions to it. Maybe the summer was life-as-usual for you (except, of course, very hot). So come celebrate the change in weather – and while you’re at it, meet some new people with similar interests, catch up with old friends, hear some fantastic stories, and enjoy some mid-afternoon snacks and tea. RSVP, invite your friends, and share photos, discussion topics, and questions on the FB Event Page. The Yoga Enthusiasts Social provides an evening of eating, socializing, and talking about yoga. YES is a recurring event, every few months, and is designed for all people interested in learning more about yoga. If geeking-out on yoga sounds like your kind of night, we hope to see you there! For more information, check out the YES page of this site. If you’re interested in presenting, leading discussions, or coordinating, email me at percolateyoga [at] gmail [dot] com. In such a rational world, it can be disconcerting (to say the least) to think about what it is that makes our lives “worthwhile.” This is a question/issue/thought-experiment that has consumed much thinking, and sometimes deliberating, throughout my life—at some times more than at others. Just this morning, I read an article on Brain Pickings that summarizes Leo Tolstoy’s historical experiences and thought processes on the matter: “Leo Tolstoy on Finding Meaning in a Meaningless World.” I found that Tolstoy provides a useful, rational, and irrational answer to this question. Furthermore, I think that his findings have an important implication for the many in our society with negative feelings toward religion, spirituality, faith, etc. These negative feelings arise within a very large scale, ranging from indifferent to adamantly anti-religion/-anything. After reading this article, it appears to me that we must all have some element of faith, merely insofar as we still choose to live, whether it be easy for us to choose so or extremely challenging. I have personally experienced this wide spectrum of desire for life, which I think is one reason Tolstoy’s arguments struck me so intensely. While I intend to respond more fully to some of the thoughts and issues inherent in the Tolstoy article, I’d like to leave you with a short(er) summary of Tolstoy’s thought process on the matter (emphasis is my own). “I asked: ‘What is the meaning of my life, beyond time, cause, and space?’ And I replied to quite another question: ‘What is the meaning of my life within time, cause, and space?’ With the result that, after long efforts of thought, the answer I reached was: ‘None.’…. “Having understood this, I understood that it was not possible to seek in rational knowledge for a reply to my question, and that the reply given by rational knowledge is a mere indication that a reply can only be obtained by a different statement of the question and only when the relation of the finite to the infinite is included in the question. And I understood that, however irrational and distorted might be the replies given by faith, they have this advantage, that they introduce into every answer a relation between the finite and the infinite, without which there can be no solution. See the linked article by Maria Popova for a longer exposition and opportunities to find his full work. 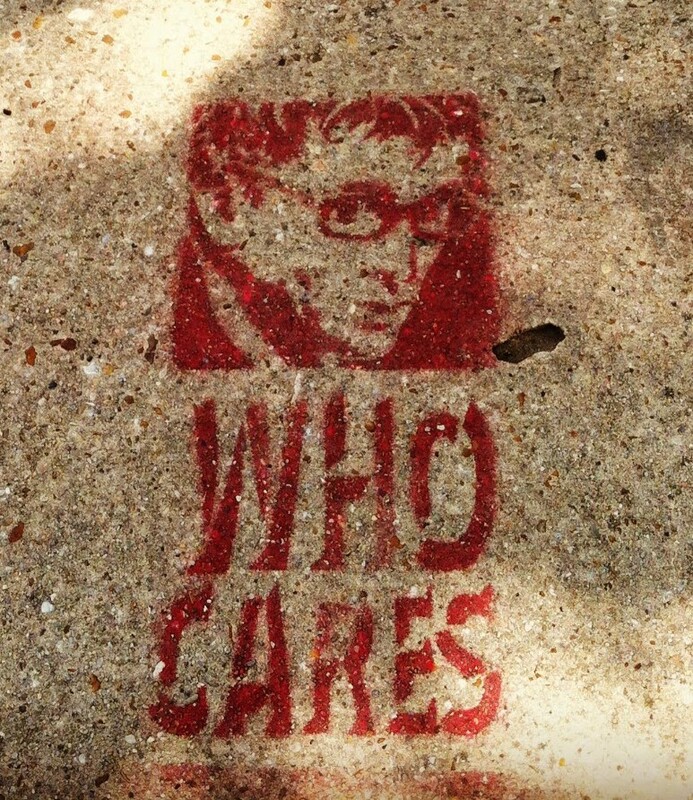 Photo of sidewalk graffiti in New Orleans, artist unknown; photo by Maggie in June, 2013. I have spent, and still do spend, a lot of my life feeling obligated to do certain things. I guess it’s a bit complicated to explain; and, anyway, I never really noticed it until the drama of graduate school (I guess we can call that my existential crisis). I’ve noticed that many other people experience this internal belief as well—that they have to be a particular way or do certain things, and/or in a specific way. Spoiler alert: it’s all related to judgement and how we judge ourselves. But we’ll get to that later. One thing that I love about yoga—that I didn’t notice about it until after about eight years of practice—is that it demands nothing of me. I don’t have to do yoga. I don’t have to do a downward-facing dog pose; I don’t have to do asana first, pranayama second, and meditation third; I don’t have to practice for at least 50 minutes at a time for it to be “worth it”; I don’t even have to roll out my mat every day. I don’t have to do a damn thing. It’s really such a relief. …And yet I continue to do yoga. Over and over again, I roll out my mat and try out postures with my body. Sometimes I meditate, sometimes I don’t. Sometimes I meditate without doing postures. Sometimes I practice breathing exercises in the car or when waiting in line. For nine years now, I’ve continued to do yoga—and I will (more than likely) continue to do postures until my body won’t let me anymore. Not because I have to, but because I choose to do so. First and foremost, let’s keep in mind that “injury-prevention” in yoga can often be in both the physical and “subtle” realms. As you have probably heard many times, yoga is based in a philosophy of non-harming: do not intentionally harm yourself or others. This is often discussed in the context of asanas (or yoga-on-the-mat)—do not harm your body; but let’s also remember that we are not to intentionally harm our souls, either. Hey yoga friends! I am taking a break from teaching at studios, starting next month (which, it turns out, is also next week! Yikes! when did that happen?). 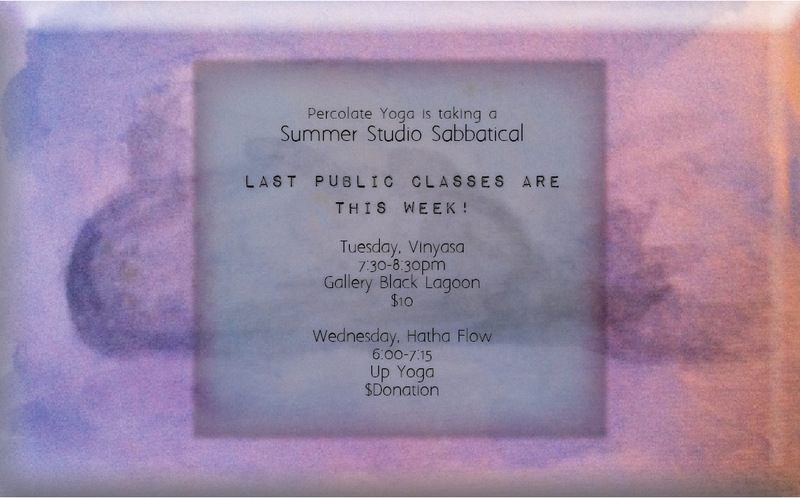 Come by for the last two Percolate public classes for the summer! I am definitely sad to leave my studio classes, but it is going to be a good move for me right now as I develop other yoga and personal projects. I AM still doing private sessions and small group teaching opportunities, though – so please don’t let this change cause you any hesitation in inquiring about those offerings. Thanks so much to my students and to the studios I have grown to love over the last seven months. I hope to be back in the relatively near future! I’m going to try a new blog thing: I’m going to write articles every once in a while that address “why yoga?” I’ve had the idea for some time now (and I have a few drafts waiting to be finished), but I wanted to send this one out already, even if it might not be the most introductory… Oh well. It stems from my previous post regarding globalization and individuality. One of the reasons I do yoga is because of the new truths that it introduces me to. I have learned so much about myself and the world around me because of my practice. I have also learned about other lessons… like, I’ve learned about states of deep concentration and meditation – but, let’s be honest, I haven’t actually attained them yet. Sometimes this sentiment helps us to relax and chill out about things; but taken on a bigger scale, it can be quite terrifying. We humans really REALLY want to just HOLD ON to things! But as Stephen Cope explains it, there is “suffering inherent in wanting to possess people, places, and things;..[while there is] true delight in simply knowing these objects…” (The Wisdom of Yoga, p. 260). Our immediate human nature believes that if we possess things, we will be happy – we want to possess our unique landmarks, our Cathedrals of Junk, our individuality, our uniqueness… It seems to me that the ultimate finding of yoga is that we cannot possess these things. That is the paradox of our condition…Our experiences are not historical, but we are. Each of us is unique but the experiences of death or love are universal and repeated. 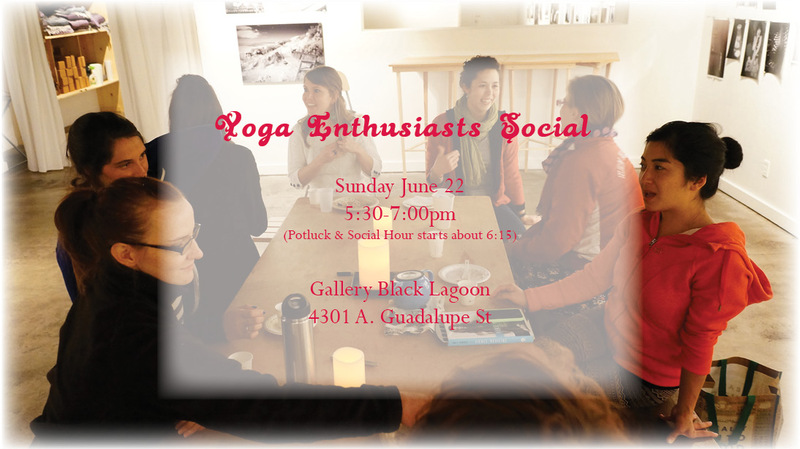 Join us at 5:30pm on Sunday, June 22nd, for the third Yoga Enthusiasts Social. We’ll start with a short, centering practice and then dive into some guided discusses (topic/theme TBD), followed by a potluck and time to socialize and further discuss any- and everything yoga. If you can’t make it right at 5:30, but would still like to join, then feel free to drop in any time after 6:15 for the potluck and socializing hour! The Yoga Enthusiasts Social provides an evening of eating, socializing, and talking about yoga. YES is a recurring event, every few months, and is designed for all people interested in learning more about yoga. For more information, check out the YES page of this site. If you’re interested in presenting, leading discussions, or coordinating, email me at percolateyoga [at] gmail [dot] com. What if we woke up one day, and there was no more unique individuality? Like, what if the Cathedral of Junk in Austin was no more unique than any other landmark anywhere – or even, that versions of it existed in every city? Is this a potential consequence of globalization? Will everything be the same everywhere? Enter your email address to follow Percolate Yoga and receive notifications of new posts by email. © Maggie Mullane and Percolate Yoga, 2013-2014. Unauthorized use and/or duplication of this material without express and written permission from this blog’s author and/or owner is strictly prohibited. Excerpts and links may be used, provided that full and clear credit is given to Maggie Mullane and Percolate Yoga with appropriate and specific direction to the original content. © Maggie Mullane and Percolate Yoga, 2013-2015. Unauthorized use and/or duplication of this material without express and written permission from this blog’s author and/or owner is strictly prohibited. Excerpts and links may be used, provided that full and clear credit is given to Maggie Mullane and Percolate Yoga with appropriate and specific direction to the original content.